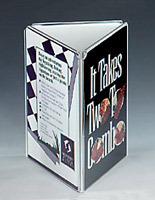 This table sign holder is a tri-fold stand with three acrylic fold-over panels for 4"w x 6"h graphics. 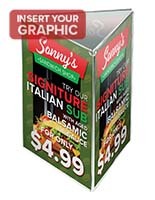 Restaurants and bars often use this multi-sided frame to advertise on tabletops and counters. Each table sign holder, also known as a triangle print frame, is easy to change-out graphics. The old print slides out the bottom. 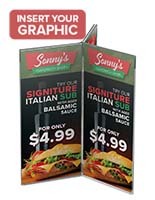 This table sign holder is the ideal advertising frame to use within a retail store or dining facility to keep guests informed and aware of new items. Use each side of the signage frame to hold different images, or opt to insert the same print into all three panels. 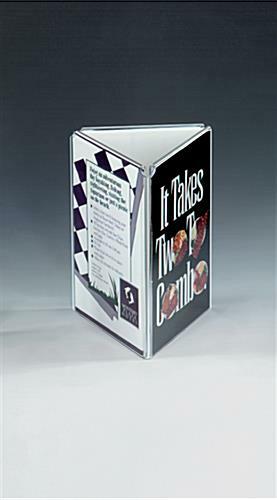 Place this table sign holder that holds three 4" x 6" menus or listings on every tabletop within a dining room to enable patrons to browse through popular food beverage options. Keep customers interested in new and exciting options, all while helping to boost your company's sales. Do you like this table sign holder, but need a different size? This online catalog features many other sizes and designs within these tabletop advertising frames. 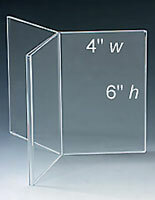 This acrylic frame, table sign holder, is sold in quantities of twelve or more to maintain low per unit pricing. 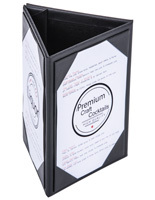 Many retailers and restaurants tend to order this tri-fold frame in bulk quantities to have extras readily available in the event of breakage or theft. Each table sign holder that is triangular has a hollow area in the middle to allow for such things as condiment bottles or extra napkins to have readily available on tabletops. 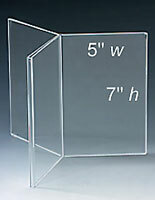 Another option for this 4" x 6" acrylic frame is as a picture display for an office desk. 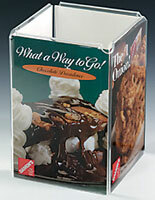 This table sign holder is a versatile display that is easy to use and affordably priced. Shipping was fast, order was accurate, I ordered 24 items, 3 came broken. Customer service was polite and to the point. Shipped out replacement same day . Enjoyed the personal service. No long holding time, no getting pushed from person to person. No nonsense good old fashioned customer service . Pleasing....Thank you thank you thank you. Hi Rick! Thank you so much for taking the time to share your experience with us. 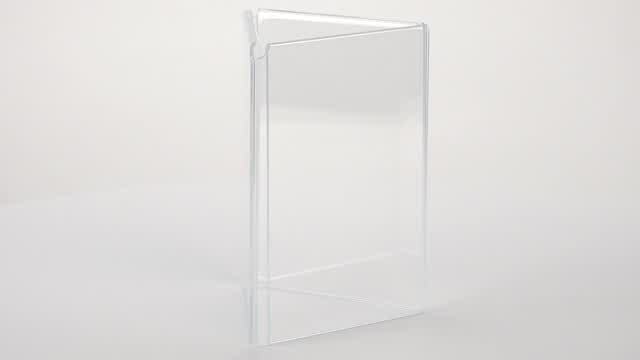 We are so sorry that 3 of your acrylic sign holders arrived damaged, but we're glad that our customer care team was able to provide a quick and easy solution for you. We appreciate your patience and understanding, and we hope you can continue to count on Displays2go for your business's needs. Great product! Works well for displaying our concessions items and also our upcoming programming! Nice cafe table top display! Easy to use, easy to see. It would be nice if they were made from a more durable material so they would not chip or crack easily when dropped or knocked off. Thanks for the thoughtful review, Susan! We hope you shop with us again soon. Very sturdy product, quick shipping, good value.